On this most recent trip back to Victoria, my mom was excited to take her friend and me to Fountain Restaurant, marketed as a restaurant specializing in gourmet Cantonese and Szechuan cuisine. 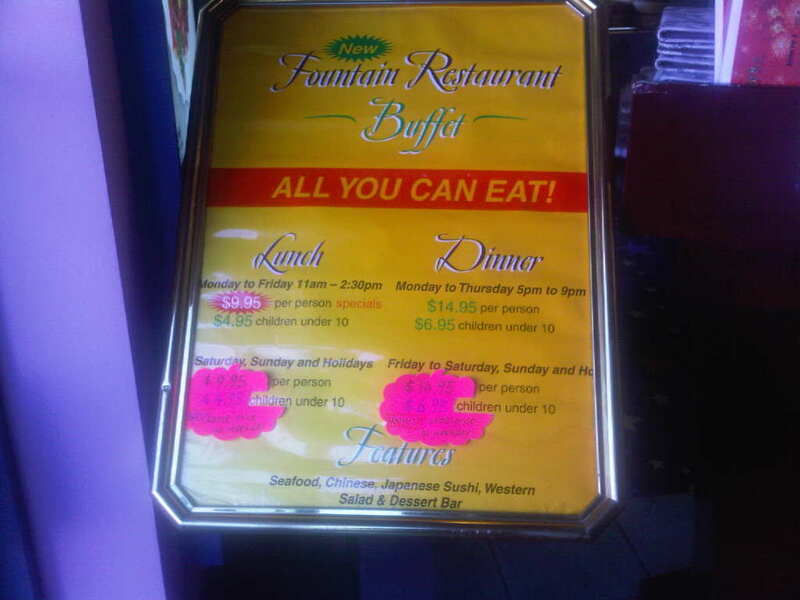 During lunch hours, you can either order off their menu or enjoy their $9.99 all-you-can-eat buffet. 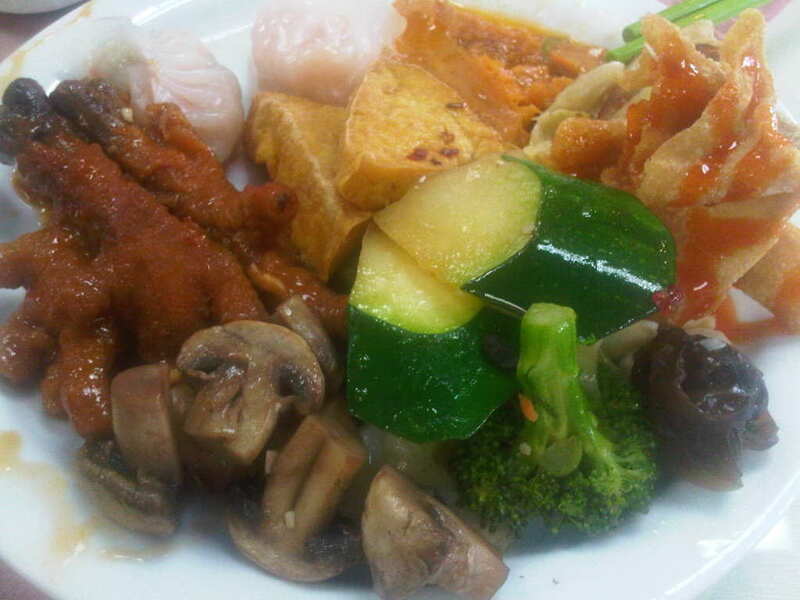 My mom highly recommended the buffet, as it offered both dim sum and your typical lunch buffet items. Upon arrival, we were greeted quite friendly by the owner, Fanny, who recognized my mom from various visits. She let us pick where we wanted to seat and told us to help ourselves to the buffet. When we arrived at 11:30am, the restaurant wasn’t busy for a Saturday morning. We were just one of 3 tables. It’s a shame, because the food quality was surprisingly decent for a buffet. The dim sum items included your typical har gow (shrimp dumpling), shui mai (pork dumpling), black bean spareribs, buns of various types (one was a sausage bun, another was a sweet custard filled bun), spring rolls, rice rolls wrapped with shrimp or beef, sticky rice wrapped in jasmine leaf, congee, etc. The regular Chinese buffet items were also present such as pan fried noodles, hot & sour soup, sweet & sour pork, stir fried vegetables, etc. They even had a mini salad bar, but with the most unusual salads – i.e. quail eggs with pickled vegetables, pickled radish and carrot slices, Caesar salad, and even sushi! Highlights of my lunch experience included really tasty pickled radish and carrot slices, a well marinated stew of beef stomach (my mom preferred the beef tendon), and the flavourful black bean sauced-chicken feet! Their deep fried squid would`ve been my favourite if they hadn`t oversalted it. To complete my tasty dim sum buffet luncheon, I had a delicious melt-in-your-mouth egg tart while my mom and her friend raved about a custard filled deep fried sesame ball. It was a treat to enjoy the egg tart as I found out they ran out and by the time we had left, they still hadn`t replenished them. I can`t wait to come back again so I can overdose on chicken feet, har gow, and deep fried squid and tofu! As we left, we noticed the restaurant had filled up for the lunch hour. Hopefully this establishment keeps it up with the quality of their dim sum buffet so it`s a highlight for those who don`t want to pay for overpriced dim sum at the other restaurants around town. Plus no waiting for a table (yet)! Usefulness and significance of your ides is awesome.